Shas is close to entering Netanyahu’s coalition and its three leaders have been offered ministerial portfolios, reports say. Shas is close to entering Prime Minister Binyamin Netanyahu’s coalition and its three leaders have been offered ministerial portfolios, Channel 10 News reported on Wednesday. 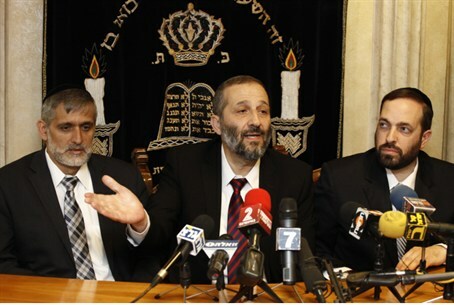 According to the report, MK Eli Yishai will be appointed Minister of Industry, Trade and Labor, MK Aryeh Deri will be Welfare Minister and MK Ariel Atias will be appointed to the position of Infrastructure Minister. The report indicated that Likud officials had told Shas that the party must be presented as having received less prestigious ministries than in the previous government, meaning it cannot receive the Interior and Housing Ministries it held in the outgoing cabinet. Yishai told Channel 10 News that the main issues in the coalition negotiations between Shas and the Likud Beytenu are the issue of equal burden in army enlistment and the next budget. He indicated that Shas is likely to agree to a plan to enlist hareidim that was outlined by Professor Eugene Kandel from the National Economics Council. The Kandel outline is essentially an upgrade of the outline proposed in the past by Minister Moshe Yaalon which focuses on recruitment goals and not quotas and would extend army recruitment to the age of 26. Accepting the Kandel outline, which was rejected outright by Yesh Atid chairman Yair Lapid, may mean that Yesh Atid will be left out of the coalition. Lapid insists on implementing a program that would see yeshiva students being drafted into the army and has imposed almost impossible preconditions on entering the government. Lapid is reportedly steadfast in his position against joining a coalition that includes Shas and United Torah Judaism. If Lapid’s party stays out of the coalition, the Bayit Yehudi may be out as well, mainly because of a pact between the two parties. The two parties have reportedly agreed to enter the coalition together or not at all, in an apparent attempt by both parties to guarantee a coalition ally with similar goals. Like Lapid, Bayit Yehudi chairman Naftali Bennett has also expressed strong support for a reform in hareidi enlistment, but unlike Lapid, he is willing to negotiate the matter with the hareidi leadership. Bennett called on Prime Minister Binyamin Netanyahu Wednesday to patch things up with the Bayit Yehudi party before it's too late. "We are at a historic junction and the ball is in the prime minister's court," Bennett told a party conference in Jerusalem's Binyanei Hauma. "There needs to be a decision – do we listen to the voice of the people or do we miss the greatness of the moment. In any case, Tzipi Livni’s joining Netanyahu’s coalition has also made it harder for the Bayit Yehudi to join, because of her stand regarding negotiations with the Palestinian Authority. The agreement between Netanyahu and Livni stipulates that she will be in charge of leading talks with the PA. The Bayit Yehudi rejects a Palestinian state, something which Livni has advocated for, though the party does not outright reject holding talks with the PA.